Here at Alan Staley Boat builders we have been restoring and building boats for over 35 years. Based in Kent we undertake all types of work on wooden boats, from dinghies to 50ft, both sail and power. Alan Staley has gained a high reputation for quality, knowledge and passion and he has not only fulfilled customers expectations but exceeded them. Please look around the website to see the full extent of his craftsmanship and don't hesitate to get in touch with any enquiry. In May, Alan won the Craft Skills Award for teaching skills in the work place. The award was presented by H.R.H. Prince Charles at The Glaziers Hall, London. Alan Staley boatbuilders can survey many different types of boat including classic boats, historical vessels and yachts. 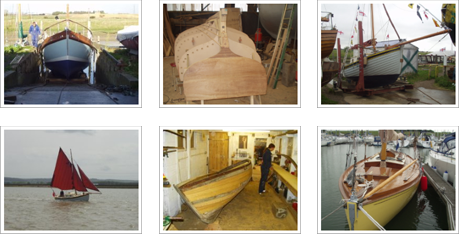 Our expertise in boats ranges from dinghys upwards and we can undertake surverys of any traditional types of craft.